You have seen him play roles on daytime that have shocked, amused, and even disgusted fans. But one thing we can safely say about Matthew Ashford is that he is one of the most fascinating, unpredictable, and compelling actors to ever embrace the soap landscape. Fortunately, he will be starring in the new and original series THE BAY coming in September. In this rare interview, We Love Soaps delves into the thoughts and spiritual beliefs behind the actor's craft, as well as his excitement about the new landscape of indie soaps. We Love Soaps: What a pleasure to speak with you! Let’s talk first about THE BAY. Tell me how this project came to you. THE BAY was started by Gregori Martin, who has a love of serialized storytelling. He grew up with it and understands the power of storytelling. When we finally got a chance to talk I had to consider where I am at in my career, and what is the most important thing for me right now. Am I being paid this exuberant sum to work on a network? Or am I being given a chance to work with friends, peers, and people I respect who I thought I’d never get a chance to work with, and to create something that has never been done before? It’s more the latter. We Love Soaps: I love what you are saying about taking control of talent. I admire how Martha Byrne, Crystal Chappell, and Michael O’Leary have all done this with their own series this past year. Instead of waiting for a role to come to them, they made it happen for themselves. Matthew Ashford: If we look back we would probably find that there were so many radio shows and so many television shows in the early '50s that came and went in weeks and months. And none of us ever heard about them because them came and went in weeks and months. This is the same thing, it’s the wild west. There’s no real hierarchy right now. People join in. Everyone is bringing the same thing. You have removed the big dollar signs. Those dollar signs are used against us as artists, as actors, as creators. As much as people say they want to get paid, it ends up dividing us in so many ways creatively. We are not there right now. We are all creating together. We Love Soaps: It’s fascinating to see it come together without network censorship and bowing down to advertisers. We Love Soaps: I have always enjoyed your roles on soaps going back to SEARCH FOR TOMORROW. You don’t do stereotypical “soap acting.” You have always brought complexity and nuance to your characters. You went to North Carolina School of the Arts with Patsy Pease who told me she was in school with you and taught you jazz at one point. 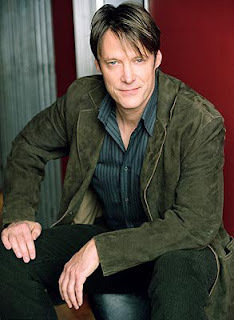 Matthew Ashford: She was a star pupil to our jazz teacher. I remember her being there as a prized pupil who could actually do what the jazz teacher was trying to teach. He would say, “Patsy, show it...” and she would. She was one of the students the teachers wanted to show off because she was hot, she was great. We Love Soaps: How would you describe your approach to acting? Matthew Ashford: I hate to draw a line between being on stage and being in front of a camera for a film or a television show in terms of portraying the truth of the moment. But there are techniques and language that are spoken. Actors have to know how to act, and how to access an honest place. Then from there they have to understand the language of the television world where they are, or the great stage where they are standing, or the tiny film moment. But that is technique. That is what I always have to keep working on and learning, and it changes. I came to realize at a certain point that daytime is this great thing sucking up and chewing in everything you have to give. A lot of people will say they don’t want to train because they don’t want to mess with their natural instrument. Well, you may have a natural instrument, you may emote, but the fact is when someone or something takes what you have, and uses it up in a blink of an eye, and then says to you, “What else do you have?”, you have to suddenly go back and ask what you have. So the technique is digging deeper and finding ways to express things or to share things only as you are willing. I began to find that the truth that I was willing to give out, especially on DAYS, was sometimes very deep, deep inside, and I didn’t need to give it up in one day. They would have been happy for me to give it all in one day. The important thing was that I understood what the truth was, and the audience understood what it was. Jack had a deep need and desire. And every day we moved closer to that moment. But it is not an ultimate moment because daytime goes on and on and on. I started finding a way to tell a story that never ends. I try to make it about the journey. EDITOR'S NOTE: Please press here for Part Two in which Matthew discusses his transformation of Cagney on SEARCH FOR TOMORROW, and Jack's journey on DAYS OF OUR LIVES. What Broadway musical was he listening to during Jack's violent reign in Salem? Find out in Part Two! Until then, check out the latest "confessions" from THE BAY.